Prices are based on 2 sharing a room and the length of stay at hotel. Offer subject to availability at the time of booking. Terms and Conditions apply. 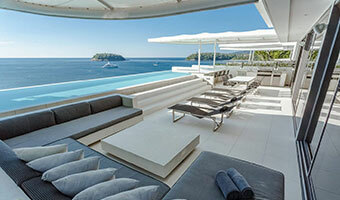 Luxury is truly limitless at Kata Rocks. Here, you’ll find an elegant yet minimalist vibe that is perfect for couples and families to enjoy solitude, serenity and pure sanctuary from start to finish. To put it simply, Kata definitely rocks. This stunning hotel is perched on spectacular cliff for the ultimate views of the sparkling Andaman Sea. Just as beautiful on the inside as it is on the out, expect white-on-white contemporary décor, an incredible spa and delicious on-site restaurants that attract both locals and visitors alike. Have we convinced you yet? 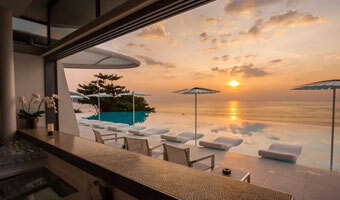 The accommodation options at Kata Rocks certainly have to be seen to be believed. Incorporating the rock formation of the cliff-side location, every gorgeous villa is beautifully in harmony with its exterior surroundings. The white-on-white décor provides an elegantly modern feel while the plush furnishings are guaranteed to make you feel right at home. Welcome to paradise. Perfect for those on a romantic retreat, the One-Bedroom Sky Pool Villa offers unobstructed ocean views that are certain to have you pinching yourself. Designed with both comfort and elegance in mind, expect to find a Nespresso coffee machine, two HD LCD televisions and an electronic safe. 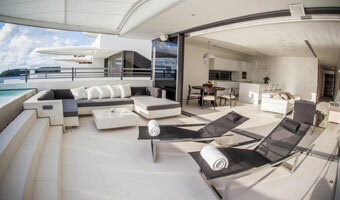 The Two-Bedroom Sky Pool Villa is ideal for four adults and two children to share. 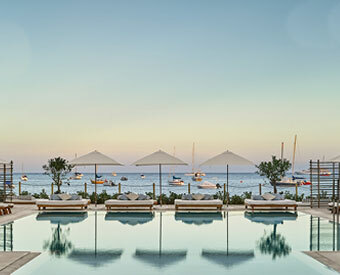 Brilliantly spacious and contemporarily decorated, guests will fall head over heels with the likes of the Italian-style kitchen, the seven-metre infinity pool and the signature bathroom amenities. You’re promised to feel like nothing less than royalty with a luxurious stay in Kata Rocks’ brilliant four-bedroom penthouse. Think an outdoor cooking station, a swim-up pool bar and an interactive entertainment system – yes, all in your room! What more could you possibly need? All guest rooms and suites feature air-conditioning, a mini-bar, tea and coffee-making facilities, a hairdryer, bathrobes and slippers, bathro amenities, personal safe, LCD television with satellite/cable, DVD/CD player, telephone, wi-fi internet access, an entertainment system which provides access to movies and music, and a twice-daily maid service. iPod/iPhone docking stations can be supplied on request. 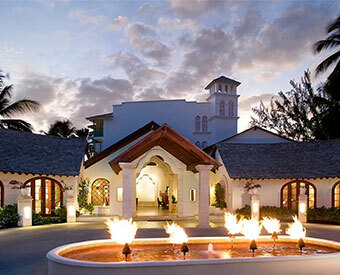 Sandy Lane provides a complimentary packing and unpacking service. 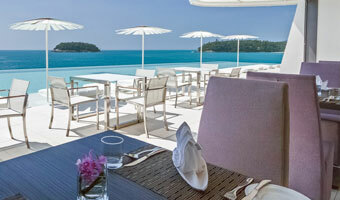 Open for breakfast, lunch and dinner, the main Restaurant at Kata Rocks offers the most delightful vistas of Phuket from morning until evening. Culinary excellence certainly doesn’t go amiss here as guests can tuck into the likes of wagyu beef tenderloin, butter poached lobster and slow-cooked truffle crusted chicken. 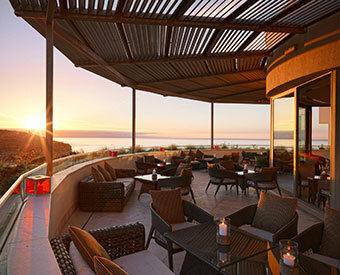 Kata Rocks’ on-site Lounge and Bar is the ultimate destination for cocktails, tapas and relaxation. Ideal for drinks either before or after dinner (or both, we’re not judging), the contemporary setting offers an unforgettable ambience and sights of the gorgeous Phuket sunset when evening falls. Our advice? Try the passion mojito – it’ll change your life! The Infinite Luxury Spa at Kata Rocks is guaranteed to blow your socks off. This is the place where rest, recovery and relaxation are the main priority and trained professionals use their healing hands to send you straight to heaven. Infinite Luxury Spa uses natural ILA products in each of its treatments whether it be a pampering massage, a revitalising face mask or a personalised therapy session that tends to individual needs. In-villa spa treatments are also available – we told you that your accommodation would be too luxurious to leave! As a family-friendly resort, Kata Rocks undoubtedly knows how to cater for children to ensure they have just as much as fun as the adults. 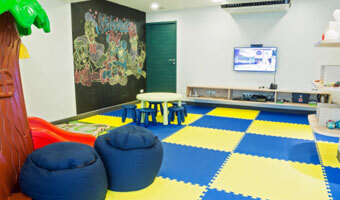 A dedicated childcare entertainment facility is on hand to keep the little ones out of your hair where they’ll engage with their peers playing games, watching their favourite cartoons and doing arts and crafts. Oh, and don’t think you have to sneak off to the spa – just bring the kids with you! Infinite Luxury Spa offers a Pebble Spa menu for your little prince or princess aged between five and 12 for the ultimate family pampering day. 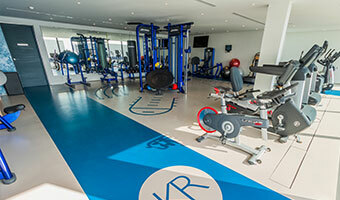 Keep in shape during your holiday with a visit to Kata Rocks’ on-site fitness centre. Considered one of the most high-technology fitness facilities in Phuket, the gym encourages guests to download an app onto their smartphones. The app interacts with the compatible equipment and machines to track workout progress and achieve personal targets. In the mood for something with a slower pace? The fitness centre offers yoga classes led by resident instructors, suitable for travellers of every age and ability. Kata Rocks lives up to its name by being perched on the rocky cliffs of Kata overlooking the cerulean waters of the Andaman Sea. Located on the south west coast of Phuket, Kata is popular amongst the yachting crowd and guests can admire views of the elegant boats sailing across the water during the day. The hotel is just a 10-minute walk from Kata Noi and Kata Yai beaches, perfect for soaking up the Phuket sunshine. On the way to the beach you’ll find a plethora of authentic restaurants, bars, shops and massage centres – prime location or what? 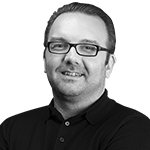 But that’s not all… Each offer is considered a starting block which we can tweak and customise to suit your specific needs. 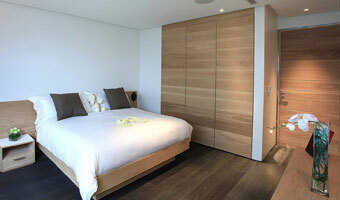 Want to discuss our bespoke options? Call 0203 816 0985 today and let’s Plan Your Trip. Can’t spot your favourite destination or hotel? 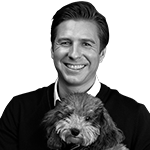 Never fear – this is just a selection of what we can do!